July 19: Join us in Pittsburgh with Lady Parts Justice League | Come Check out Our NEW Site! 7:30PM. Wed., July 19. 400 Lincoln Ave., Millvale. $15-20 (21 and over). 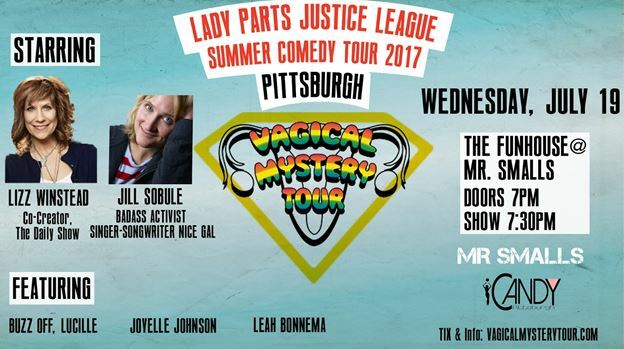 Lady Parts Justice League is on a comedy-and-activism themed road trip they’re calling the Vagical Mystery Tour this summer, and the Women’s Law Project will be a part of their Pittsburgh show! The Pittsburgh event features host Lizz Winstead, comedians Leah Bonnema, Alex English and Joyelle Johnson, the sketch troupe Buzz Off Lucille, and musician Jill Sobule. Pennsylvania is a must-see destination on a road trip where the idea is to stop in every state where equal access to reproductive healthcare is under attack. “I think a lot of people don’t realize that Pennsylvania is a hotbed of [anti-]abortion extremism,” Winstead recently told the Pittsburgh CityPaper. If this information surprises you, and you live in Pennsylvania, please sign up for our Action Alerts, and check out these 12 facts about the attacks on reproductive rights and health in Pennsylvania. We hope to see you at the Funhouse on July 19! Find tickets here. The Women’s Law Project is the only public interest law center in Pennsylvania devoted to advancing the rights of women and girls. Sign up for WLP’s Action Alerts here. Stay up to date on issues and policy by subscribing to our blog, following us on twitter and liking us on Facebook. We are a non-profit organization. Please consider supporting equal rights for women and girls by making a one-time donation or scheduling a monthly contribution. This entry was posted in You're Invited and tagged Abortion, Lady Parts Justice League, Pennsylvania, Pittsburgh, Reproductive Rights, Susan Frietsche. Bookmark the permalink.